As part of the approval for the change of use of the vacant industrial buildings a contaminated land panning condition was attached. Demeter Environmental were commissioned to undertake a desk study report to identify any potential issues. The desk study identified a number of potentially contamination industries on the site (depot, timber yard etc), adjoining the site and in close proximity to the site. 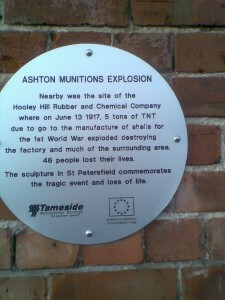 The walker survey identified a plague opposite the site which made reference to the Ashton Munitions Explosion of the adjacent works in 1917. Minor revisions were made to the desk study report to satisfy the planning authority and the site investigation was undertaken to determine the risks present on the site. The Phase II report concluded that whilst the site did not pose a risk to human health, there was the potential for the accumulation of ground gases and a risk of hydrocarbons permeating water mains. After further minor revisions the conclusions were accepted and the development allowed to proceed.